MON. FEB. 27, 2012 - LOS ANGELES - Kyle Kingman's voice crackled over the diver communication system just after 12:30 p.m. on Thursday afternoon, January 19, 2012: "I need an evidence bag." The statement set forth a hushed, yet excited twitter among those on land at the terminus of Coles Avenue overlooking the Amityville Canal. When Bill Pfeiffer, head of a diving team contracted by Ryan Katzenbach's production shingle KatcoMedia asked Kingman to "copy again" wherein he repeated the same thing, the excitement grew. 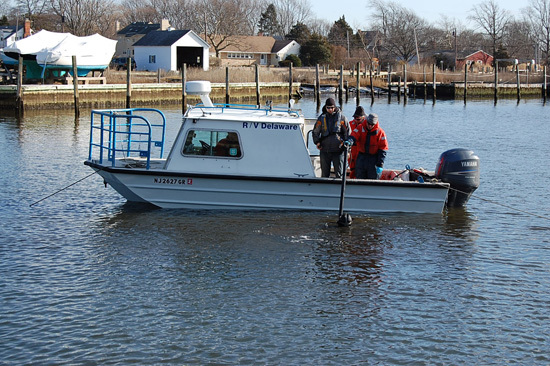 Kyle Kingman, a geologist with AquaSurvey was positioned on a boat directly over a target in the Amityville Canal. For some time, the AS team and as Pfeiffer-team diver Bryan Joyce had been working this target area trying to secure a metallic target that was eluding the probe. Joyce had been working on the canal floor --- or rather, at this point --- below it. For the past ten months, Pfeiffer and his team have been working for LA based documentarian Ryan Katzenbach in an effort to locate a lost weapon associated with a famous mass murder --- that of the DeFeo family, a massacre which spawned The Amityville Horror franchise of films and books. Finally, after considerable effort, Joyce was finally able to put his hands on the steel object. However, due to zero visibility, he really had no idea WHAT he had. The digging efforts, combined with the use of a suction dredge had churned up the murky bottom of the canal floor -- Joyce was in pitch black environment. On November 13, 1974, 23-year old Ronald J. DeFeo Jr., known to his friends and family as "Butch," walked through his parent's home in Amityville and executed 6 members of his family as they slept. The murder was carried out with DeFeo using a .35 caliber Marlin 336 hunting rifle. No one woke up, and there was no sign of struggle. 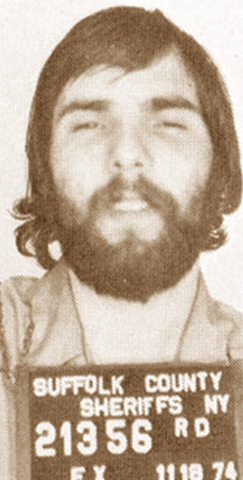 Ronald Joseph DeFeo, Jr. at the time of his arrest for the mass murder of his family. Nearly four decades after the crime that inspired The Amityville Horror, Ryan Katzenbach's documentary trilogy, Shattered Hopes: The True Story of the Amityville Murders dives deep into the forensics of the DeFeo crime, and, last week, dug even deeper into the soft anaerobic black sludge of the Amityville Canal in pursuit of the truth. While examining theories as to whether 23-year old DeFeo had accomplices to his crime, Katzenbach believes that there was likely a second gun, specifically a .38 pistol, used in the killing of at least one member of the DeFeo family. Over the past -- and last---year of production for Shattered Hopes, a project that has been filming for 6 years, Katzenbach has become certain that he is correct in his conclusions. His research has come to encompass never before obtained documents, which include ballistics notes and witness statements, as well as very specific remarks, made by various individuals in the Shattered Hopes interviews. As a result, Katzenbach became certain, in February 2011, that there was in fact a second gun used in the DeFeo massacre. 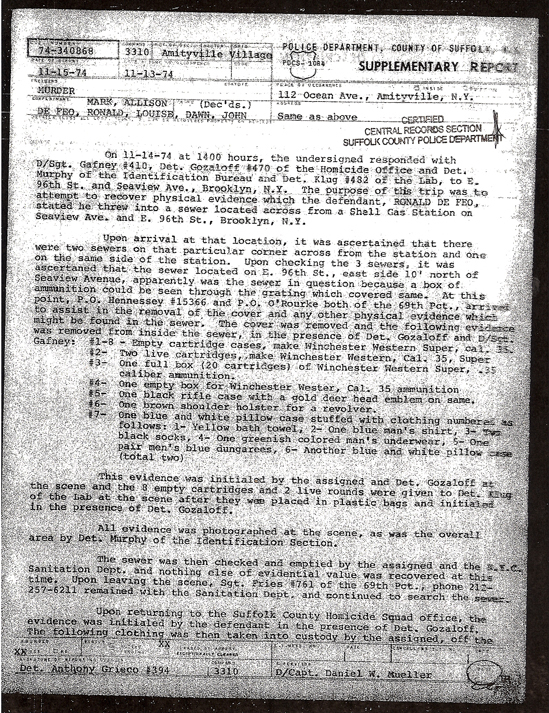 ABOVE, One of the documents that caught Ryan Katzenbach's attention was a witness statement regarding one of the individuals named as a participant in the murders and this individual's acquisition of 2 .38 revolvers -- one which was known to remain in their possession at the time the DeFeo murders occurred. That gun has never been accounted for. BELOW, a piece of ballistics notes jotted down by Alfred DellaPenna. In this, he is noting the qualities of one of the bullets removed from a DeFeo victim, Item #38. The bullet "Displays 12L 12G" which means Lands & Grooves. The bullet is 170 grains and has a diameter of .355, which is entirely consistent with that of the Marlin 336 rifle. 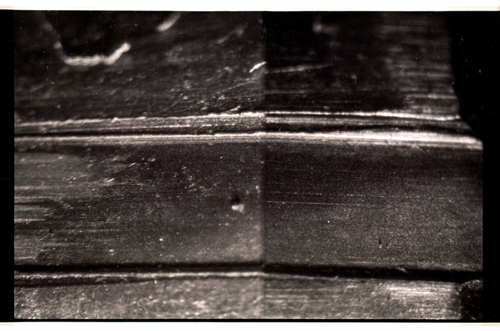 ABOVE, One of many photos obtained by Shattered Hopes for use in the documentary of the DeFeo bullets and the microscopic analysis done on them. On one side (specific side unknown) is a test bullet fired from the Marlin rifle; on the opposite side is a picture of one of the slugs removed from the DeFeo victim. The two are then laid together to see if the straie lines up. In this particular case, it clearly does. The turning point came when Shattered producer Gail Bleckman obtained various crime scene photographs from the Suffolk County Police Department. 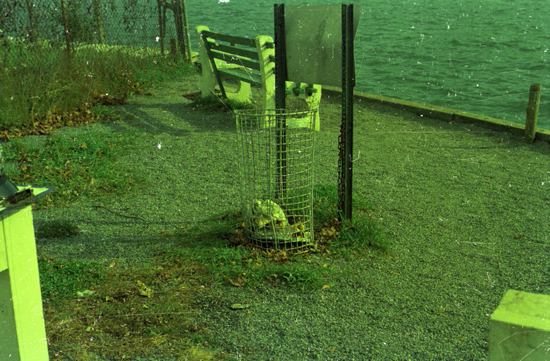 One photo was that of a wire-trashcan at the end of Coles Avenue. 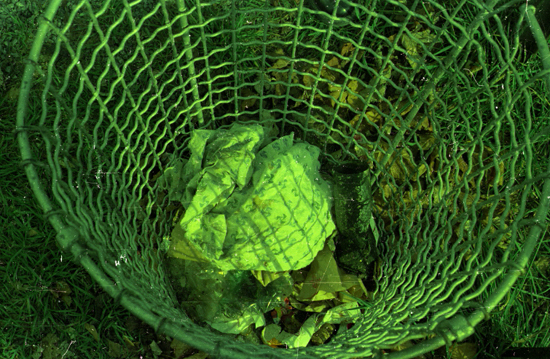 "There is a photo that has been around for years of this trashcan, and all we know is that the photo was taken because there was some interest in what was described as a "rag" in that trashcan. The rag was even taken as evidence in the case on the morning of November 14, 1974," explains Katzenbach. "When Gail got another photograph that was a different angle that looked directly down into the trashcan, it appeared that the rag was actually a pillow case or a piece of bed linen. That got me to thinking and when I presented all the facts to Gail, she agreed with me as to the thesis that the second gun had ended up in the canal." In 2001, Ric Osuna's book, The Night The DeFeos Died, upon which Shattered draws its basis, reported that Ronnie DeFeo had told the author that his friend Bobby Kelske participated in the murders along with himself and his sister, Dawn, 19. The gun was, according to DeFeo in his interview with Osuna, property of Bobby Kelske and it was Kelske that fired the second shot into Louise DeFeo after she moaned in agony or stirred while lying in her bed that night. According to DeFeo, Bobby Kelske would then dispose of this revolver, which he described as a .38 Colt Python, in a smudge pot at his grandfather's Buick dealership. This smelting vat was, reportedly, used to melt down old car parts. Over the years, Katzenbach became leery of this particular account given to Ric Osuna. "I always, through the years, kept coming back to that waste can and wondered what the significance was. Obviously, the Suffolk Police believed that there was some significance in order to photograph it, and in order to take the rag into evidence," says Katzenbach. "That significance presented itself when I saw the second photo for the first time. The reason it caught my eye was because I knew that pillowcases had been used to dispose of spent shell casings, ammo and even Butch DeFeo's clothing in the aftermath of the murders. And here, in the trashcan, is what appears to be a pillowcase, so that really caught my eye and was the deciding factor in making an attempt to look for the gun." 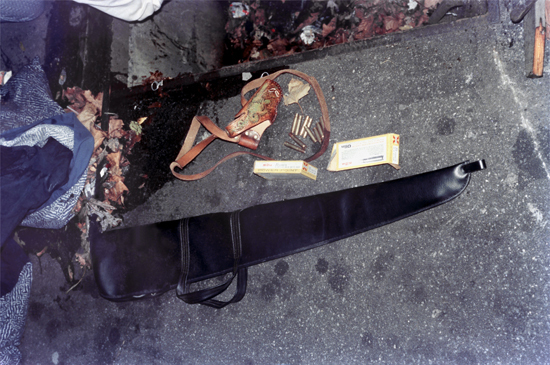 Furthermore, in 1974, when DeFeo's clothing was recovered, along with the spent casings, from a storm drain at 96th & Seaview Avenues in Brooklyn, where he disposed of them in the early morning hours of November 13, 1974, present in the pictures were a scabbard for the Marlin rifle as well as a holster for a handgun. ABOVE, Left, pillowcases from the DeFeo house that contained Butch DeFeo's clothing and other items. Note the presence of the handgun holster in this photo, along with the scabbard for the Marlin .35 rifle. BELOW, the report outlining what was found in the Brooklyn sewer. "The presence of that holster indicates that there was handgun involved in my mind," says Katzenbach. "Why would they dispose of ammo, the soft case for the rifle, the clothing....spent shells...everything related to the crime and firearms and dump a random holster in that drain? It makes no sense." Katzenbach's forensic criminologists, he says, agreed with her assertion, when they did a "forensic autopsy" of the DeFeo case, which took nearly 10 months to complete. Katzenbach, along with co-producers Gail Bleckman and Diana Maiocco, began to believe that most likely, both guns -- the Marlin and the .38 -- were likely in the water off Ocean Avenue. The Amityville Canal, which is a man-made waterway, backs up to the DeFeo house and runs parallel to Ocean Avenue. 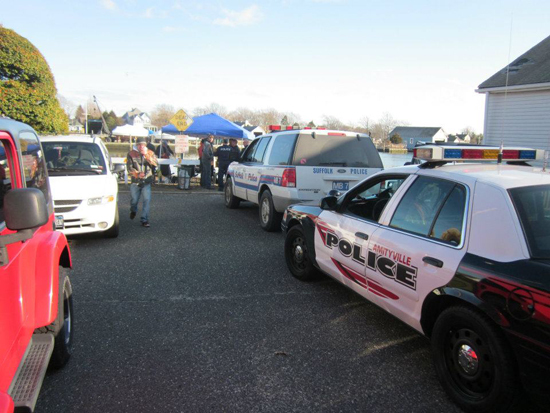 Ronnie DeFeo Jr. told Ric Osuna that it was actually his friend, Kelske that disposed of the Marlin rifle off the end of the Amityville Municipal dock at Richmond Street. DeFeo, in The Night The DeFeos Died, claims that he didn't know what happened to the rifle, though the official account of the story has DeFeo drawing the cops a diagram to illustrate where he threw it. 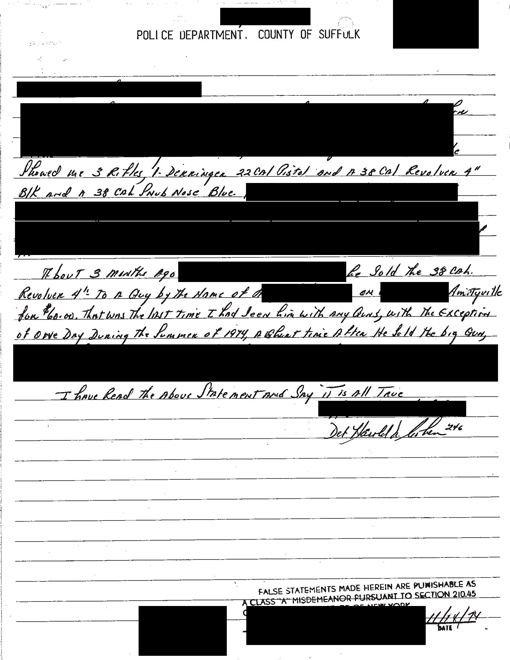 Osuna challenged the statements made by detectives in his book, and according to Nassau County Diver Melvin Berger in official court transcript, who was on loan to Suffolk at the time of the murders, the detectives were actually drawing diagrams that they would attribute to DeFeo on the police boat. 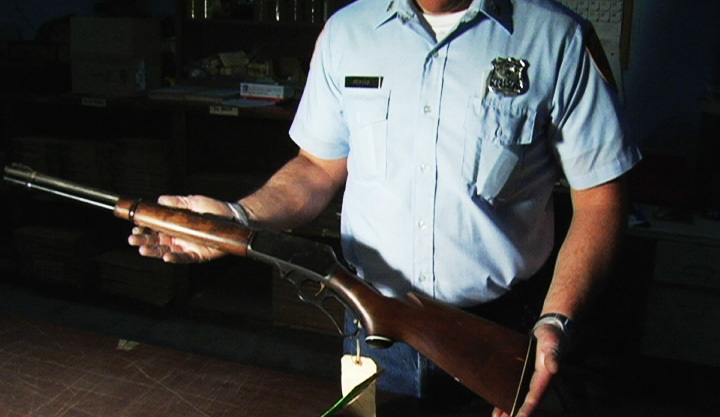 ABOVE, The actual Marlin rifle used to kill the DeFeos. This photograph was taken at the Suffolk County Property Division in May 2007 by Ryan Katzenbach. "I thought it was logical that if ONE gun was in the water, BOTH guns would likely be in the water. I think there was a sense of urgency to get rid of these murder weapons very quickly, and the canal became a logical, and obvious, spot," says Katzenbach. 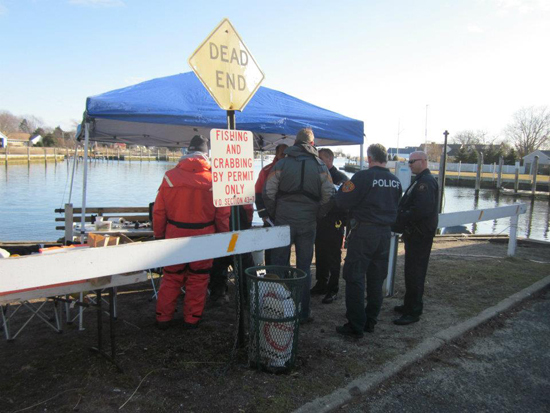 "When I try to get inside the head of the person who threw these in the water, it made total sense to me that they would throw one gun in one spot...the rifle off the Richmond Dock, and then toss the handgun in another spot." 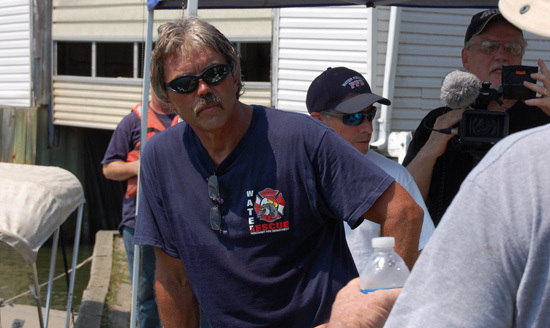 In March of 2011, Gail Bleckman located, on a recommendation, Bill Pfeiffer, a well-known and respected search and rescue diver who works with Nesconset Fire & Rescue in addition to running his own full-time business. In initial conversations, Pfeiffer would outline to Katzenbach a plan of attack for how to locate the .38 if it were really at the bottom of the canal. First, said Pfeiffer, a comprehensive electromagnetic survey needed to be completed. 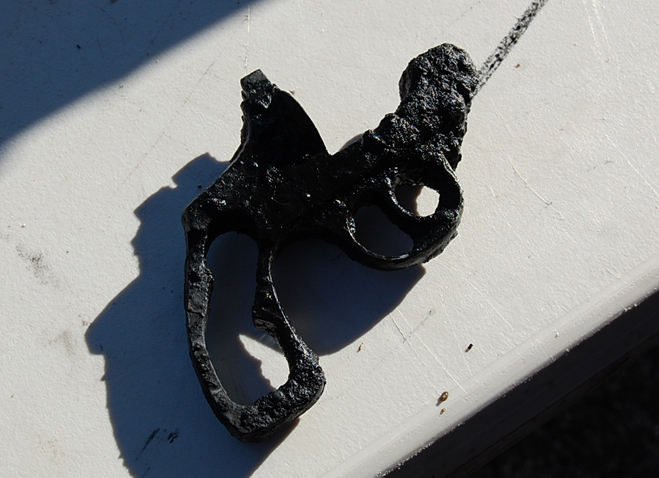 This survey could pick up metal objects buried in the soft silt and mud of the canal floor, and from the start, it was believed that this revolver would have sunk, through the years given its weight, deeper and deeper into the mud. How deep the mud and silt was, in the canal, was anyone's guess, but before any survey could be done, Bill Pfeiffer and his crew went to work with a quick dive into the canal to assess depth of water and exactly how deep the mud was that was being dealt with. "We needed to know if there was a car in the canal...or other obstacles that would hinder obtaining the EM survey," says Pfeiffer. 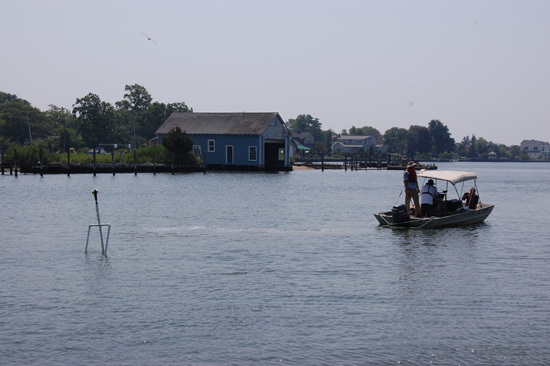 ABOVE, Deploying one of the two AquaSurvey sleds that would be used during the survey. 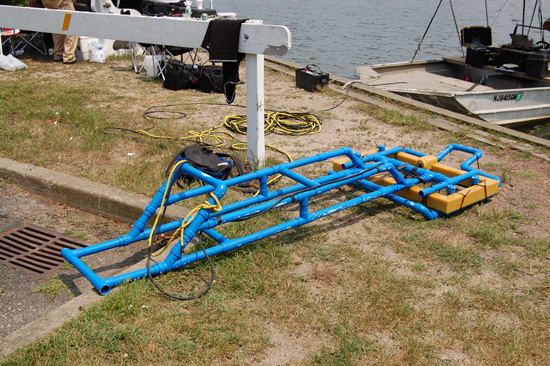 This larger sled made wide passes over the target area in a fashion similiar to "moving the lawn." The electromagnetic coil could peer up to 6 feet into the mud. BELOW, the smaller AquaSurvey sled was lighter and sometimes easier to navigate into tighter areas. The Flemington, New Jersey based AquaSurvey, owned by Ken Hayes, was immediately contracted by Katzenbach and brought aboard to assist Pfeiffer who had worked with Hayes on other projects. AS is an industry leader that specializes in underwater survey. They typically work in much greater depths than those presented by the Amityville canal. AS has been involved in numerous high-profile treasure hunts; they have been hired to locate unexploded munitions and bombs by the U.S. and other foreign governments, and they recently spent over 3 months in Lao mapping unexploded bombs in the jungle. Believed Pfeiffer and Katzenbach, if there was a group that could map the canal and help locate the gun, it was, indeed, Kenny Hayes' AquaSurvey. "If the gun is there," says Bill Pfeiffer early on to Ryan Katzenbach, "we WILL find it. And if we don't find it, then we can conclusively say that it was NEVER there...that's how accurate the technology we're dealing with is." AS would tow one of their electromagnetic sleds on the bottom of the canal, via a boat. The sled would provide their onboard computers with various readings that allowed, in most cases, AS geologists to differentiate what type of metal they were seeing. As the EM signal was fed to computers, a military-grade GPS system would lock each reading and map the coordinates. After the survey was done, AS would then be able to guide divers, within 2-inches of accuracy, to the target. ABOVE, The AquaSurvey crew tows, with the assistance of an underwater diver, the sled while collecting electromagnetic and GPS data. AS finished the survey at the end of July 2011 and fed the data through their computer system. In all, the survey had recorded 317 metal "hits" from various depths of the canal's muddy floor, some as deep as six feet. "The system is so precise that it was able to determine a soda can from a piece of metal pipe," says Bill Pfeiffer, "and it was this type of accuracy that we needed to narrow down the search." Of the 317 targets, the search was honed down to several dozen sites of interest. In October, the dive team, aided by AquaSurvey, began digging targets. The process was being filmed extensively for Shattered Hopes' third and final installment in the trilogy. Maureen and Stephen Langevin were brought in to video the underwater search, while John Kay, John Collins and Bjoern Kils served as additional camera units topside with Ryan Katzenbach filming a great deal of the dives himself. 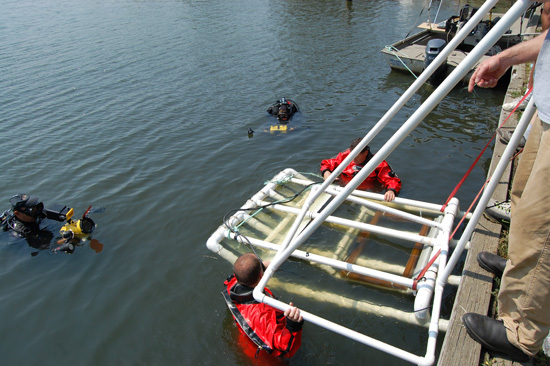 The AquaSurvey operation was funded entirely by KatcoMedia partners Ryan Katzenbach and Diana Maiocco, and no taxpayer dollars were spent on the operation, excepting those expended by local law enforcement that had insisted on supervising the operation as a condition of granting permission for the dives. Bill Pfeiffer's Island Diving provided gasses and divers, which most of the divers very graciously donating their time to the expedition. In addition, a number of other devoted parties donated equipment, like suction dredges, to the effort -- all in the name of the adventure. 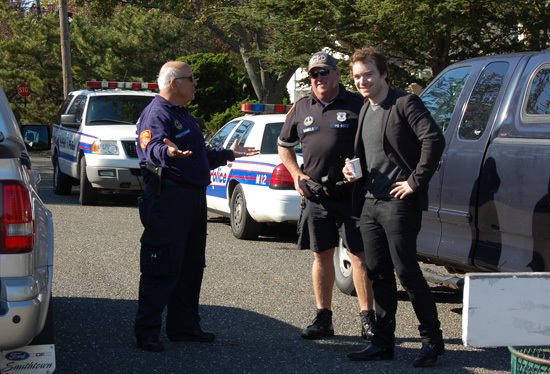 ABOVE, Suffolk County Police Officers supervise the dive operation while chatting with Maxim Magazine Senior Editor Seth Porges. On January 19-20, the team returned to finish the job -- something that was done early in the afternoon of the 19th thus eliminating the need to dive on the 20th. Working approximately 60-70 feet off the bulkhead, AquaSurvey anchored their boat in a spot that had been of particular interest early on. ABOVE, The AquaSurvey crew on January 19, 2012 probes the spot of heightened interest from an earlier dive. It is here that the pistol would be found. "In our previous dive, due to wind on the canal, we got kicked around pretty hard and it made it very difficult in those dives to acquire targets and hold the target while the diver was digging," says Katzenbach. Each target was acquired by placing a long probe with an EM sensor at the end down into the canal. The technicians on the boat then probe the mud while moving the probe closer and closer to the spot indicated by GPS until they are fixed right on or over the target. The diver follows the probe, and using either small hand tools, his hands, or a suction dredge, then dig until the target is acquired. This process is repeated over and over with each spot being eliminated from the computer as it is dug. "You wouldn't believe the amount of metal junk we've brought out of the canal," says Katzenbach. In October, the AS/Pfeiffer team had to acquire some targets three and four times over because of choppy waters and wind. But, on January 19th, weather conditions, though very cold (water at 35 degrees) were much more agreeable. Mark Padover and Kyle Kingman, technicians and geologists with AquaSurvey, lowered the probe over a spot that had eluded the team in October. 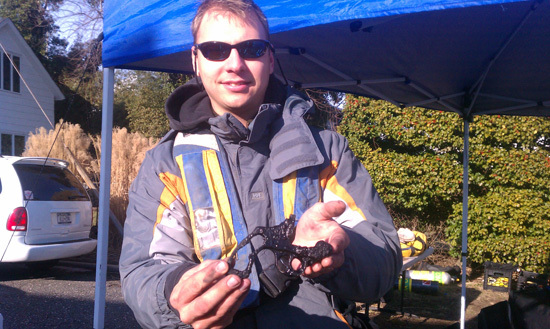 ABOVE, Kyle Kingman of AquaSurvey holds the portion of a pistol dug out of the Amityville canal. "We dug this spot repeatedly and couldn't find the target though the target was there and the EM system was telling us it was there....we went home on that day empty handed," says Katzenbach. But, they wouldn't go home empty handed on this sunny, crisp Thursday in January. "When Kyle said he needed an evidence bag, we all just stood at full attention looking at each other in disbelief." 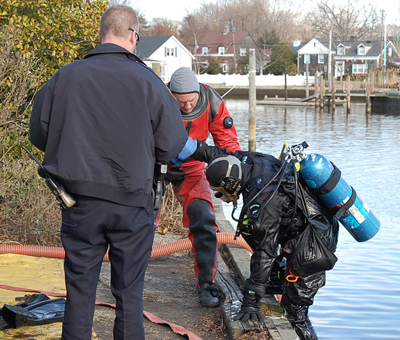 It took diver Bryan Joyce several minutes, working in 5 feet of mud and silt, to work the item loose and it was painstaking to those on the surface waiting to hear some sort of confirmation. Finally, Joyce lodged the item free and ascended to the AquaSurvey boat 8 or so feet above him. "When it hit the boat, everyone from AquaSurvey was waiting for him. Once they had the item, they began wiping it off, and that's when I heard Kyle [Kingman] yell from the water to the bulkhead 'hey, Ryan, you just hit the lottery,'" says Katzenbach. What was recovered was exactly half of a pistol -- the receiver/trigger portion. Missing was the barrel and the chamber. It took a few minutes for everyone to realize that what they were looking at was actually a "top break" revolver -- meaning that the chamber doesn't swing out for loading, but instead, the front half of the gun in hinged and slides down to expose its chamber. 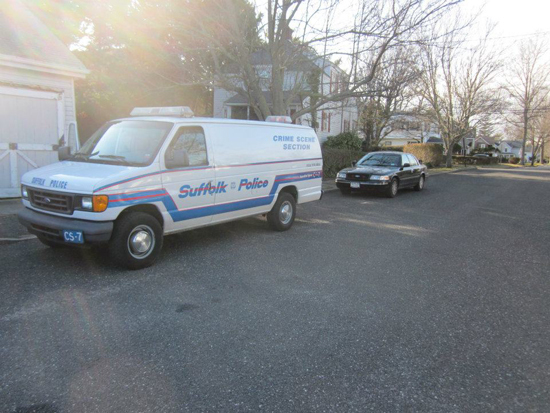 Suffolk Police, on the scene, began making phone calls and thus summoned homicide and crime scene divisions of the SCPD to the site. The gun was confiscated after the teams had an opportunity to video and photograph every inch of the gun. "The very first thing that they [SCPD personnel] said was 'you have a flare gun.' But we were in instant disagreement because we knew it was a top-break pistol," says Katzenbach. On Friday evening, Newsday, Long Island's largest newspaper, was the first to break the news with an online article telling of the discovery wherein an SCPD spokesperson stated that they did not believe the gun was related to the DeFeo case. "I hardly believe that such a conclusive statement can be made given the fact that they hadn't even had ample time to put the gun in the crime lab as they asserted they would do in an effort to ID the gun and determine what we had given them, and I was disappointed that they made this statement," says Katzenbach. "In fact, the spokesperson's own statement said that we had either located a flare gun or a revolver, so they didn't even seem to be sure WHAT they even had." According to statements made by SCPD when they issued a property receipt at the site, if it was decided that the gun isn't related to the DeFeo mass murder, the gun would be returned to Katzenbach. "If the gun comes back to us, then we will conduct our own study of the gun with the AquaSurvey lab, and with other experts we have. Because of what we have, there is certainly no reason why this gun can't be identified as to what it is, which, in and of itself could help determine age, manufacturer and help us potentially rule the gun out as being involved in the DeFeo murders." Says Katzenbach, "obviously if the gun carries enough indentifiable marks to determine it was manufactured in say, 1986, then we know it's not connected." Katzenbach is optimistic that there could be a serial number beneath all the caked-on residue, assuming it wasn't filed off before it was thrown in the water. KatcoMedia homicide consultant Michael S. Race has asserted, after viewing the pictures of the gun, that it is possibly a Harrington & Richardson .38 "Top Break" model based on certain characteristics. The gun is a "hammerless" model. Just looking at top-break hammerless revolvers on the Internet, it becomes evident that there are literally hundreds of different styles offer by various manufacturers. Another expert has offered the opinion after examining pictures that the trigger mechanism reveals it to be a "double action" firearm, which rules out that the weapon is a flare gun. "Regardless of what it is, we're going to identify that gun," says Katzenbach. Their team also includes a veteran 25-year NYPD firearms specialist who has indicated that he can identify the weapon based on the portion in possession. "Until the gun can be cleaned up and scoured thoroughly, we're really wasting our time speculating on what it is. When it's all cleaned up, then we can really look at it, compare it to other guns, and really do our homework." 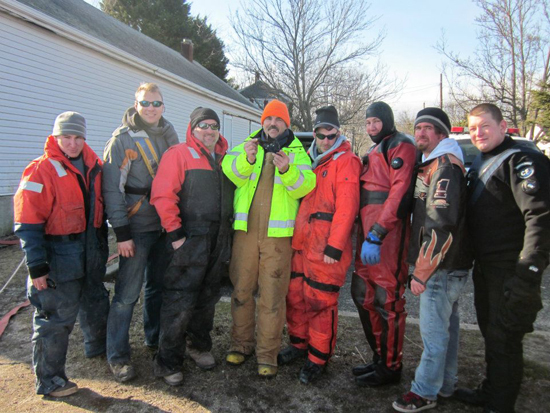 The AquaSurvey team, in the hours after discovery of the back half of the gun, and with Pfeiffer's divers, worked the bottom of the canal in an effort to locate the chamber an the barrel, but they were not successful. "The pillowcase made more sense that ever with this discovery," says Katzenbach. He believes that whoever threw the gun in the canal took the time to disassemble it first. "It makes perfect sense that they used the pillowcase to put the pieces of the gun in it and carry it to the canal. The gun would have been, likely, in three separate pieces...a barrel, a chamber and the receiver. And if they were thrown separately, it could take a considerable amount of time to locate them, but I do believe, if we decide to go this far, that would could locate them if they are there." "It's really anyone's guess as to where they are, or IF they are even there. For all we know, maybe it was THESE portions that ended up in the smudge pot at Brigante Karl Buick? The barrel, in particular, would have certainly been something you would have wanted to get rid of because of its rifling characteristics," Katzenbach says. Is Katzenbach sure of his discovery? "Absolutely. We put together all these pieces in coming up with this theory. The waste can, the rag, or pillowcase, the fact that SCPD detectives told the Nonnewitzes' during the investigation that they were looking for a second gun...the fact that they told them that there was a second caliber of bullet removed from Louise...the ballistics documents which show that the diameter of this bullet was wider than the spent Marlin slugs....and then the witness statements which established that there was a .38 factually in play, which was never found, indicate to me that we are right," says Katzenbach. "I added all that stuff up, I stood at the end of the bulkhead with Bill Pfeiffer and we estimated, looking directly in front of us, that whoever threw that gun could get a distance of 60, maybe 70 feet at best. We surveyed, we dug, and within 70 feet from the bulkhead, there's half of a pistol right where I said it would be. What are the odds of that?" This website will continue to update readers on the outcome of the investigation. For those wishing to read Bill Pfeiffer's account of the dive and survey, please click on this link to visit North Eastern Dive News. Pfeiffer, as the Editor of NEDN, has chronicled the Amityville adventure in monthly installments with the next one due at the first of February. Visit Shattered Hopes on IMDB by Clicking Here...And become a fan of our film on Facebook by Clicking Here! ALL CONTENT ON THIS WEBSITE COPYRIGHT 2011 BY RYAN KATZENBACH & KATCO MEDIA; ALL RIGHTS RESERVED.